Flax is an erect annual plant growing to 1.2 m (3 ft 11 in) tall, with slender stems. The leaves are glaucous green, slender lanceolate, 20–40 mm long and 3 mm broad. The flowers are pure pale blue, 15–25 mm diameter, with five petals; they can also be bright red. The fruit is a round, dry capsule 5–9 mm diameter, containing several glossy brown seeds shaped like an apple pip, 4–7 mm long. Flax is grown both for its seeds and for its fiber. Various parts of the plant have been used to make fabric, dye, paper, medicines, fishing nets, hair gels, and soap. Flax seed is the source of linseed oil, which is used as an edible oil, as a nutritional supplement, and as an ingredient in many wood finishing products. Flax is also grown as an ornamental plant in gardens. Flax seeds come in two basic varieties: (1) brown; and (2) yellow or golden. Most types have similar nutritional characteristics and equal numbers of short-chain omega-3 fatty acids. The exception is a type of yellow flax called solin (trade name Linola), which has a completely different oil profile and is very low in omega-3 FAs. Although brown flax can be consumed as readily as yellow, and has been for thousands of years, it is better known as an ingredient in paints, fiber and cattle feed. 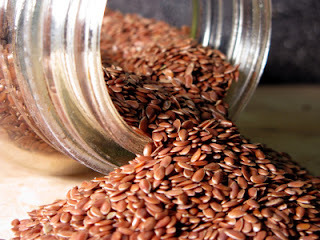 Flax seeds produce a vegetable oil known as flaxseed or linseed oil, which is one of the oldest commercial oils, and solvent-processed flax seed oil has been used for centuries as a drying oil in painting and varnishing. Flaxseed is very rich in Omega-3 oils, those essential fatty acids that are so important for our health, and the health of our skin and hair. Regular Users of Flaxseed on their hair are reporting that there was a notable difference in helping to prevent hair loss as well as strengthening the hair. Users found that their scalp felt good thus producing nice healthy vibrant strong hair. We are finding this now to be a common case that users of flax seed are finding less and less hair on their pillows and since using flax seed on their hair less has been falling out and their existing hair feels stronger and more vibrant. There are many products you can buy on the market now that contain Flaxseed nutrition. These can be found in hair sprays, hair mousses etc.